Sabic has been named a winner of the prestigious Crystal Cabin Award in the category of Materials and Components at an award ceremony on April 14, 2015 in Hamburg, held in conjunction with the Aircraft Interiors Expo. Sabic was honoured with the award for its Clear Lexan XHR sheet series, the company’s inaugural entry into the only international competition for excellence in aircraft interior innovation, now in its ninth year. Clear Lexan XHR sheet series, a lightweight engineered thermoplastic material, was developed in response to the airline industry’s ongoing desire for a transparent material that would help to differentiate cabin interior designs. This innovative solution offers the highest level of light transmission available in an OSU-compliant sheet material today, meeting OSU 65/65 heat release and typical industry flame, smoke, toxicity (FST) requirements (FAR25.853, BSS7239, ABD0031), expanding design options for window reveals, partitions, refrigeration equipment, luxury interiors, walls, security partitions, oversized windows, self-service refreshment stations, instrument displays, divider panels and mirrors. 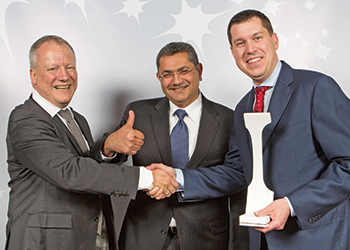 "Sabic is honoured to be named a Crystal Cabin Award winner for 2015. The award is tremendous validation that our commitment to the aircraft industry – which to us, means listening to our customers and leveraging our global innovation expertise in response to their needs – is helping to solve industry challenges," Kim Choate, director of Mass Transportation for Sabic’s Innovative Plastics business, says. The Crystal Cabin Award seeks to spur the development of new products and innovative designs for aircraft cabin interiors, with the ultimate aim to create a significant improvement in passenger comfort. The competition drew a record number of participants, with 68 submissions. A total of 21 semifinalists were shortlisted, three each in seven different categories. Judging criteria included: unique/novel features of the entry; compatibility with general market demand; aesthetic and engineering qualities; usability and cost-effectiveness. Members of the panel of judges and the airlines were impressed with the material’s versatility and uniqueness. Dr Peter Vink, professor of Applied Ergonomics and Design at the University of Delft, says "airlines saw lots of possibilities to use this material in interiors due to its light weight, aesthetics, transparency and compliance with the regulations. There is no other material today that has all these properties." Peter Hardie, director of Marketing & Sales, Atrics, of Freiburg, Germany, commented that "lots of airlines have been waiting for a material like this." As aircraft interior designers seek to achieve modern, light-filled cabin environments, they require a range of transparent materials that meet the industry’s vertical burn standards and are amenable to different processing technologies. Sabic introduced its Lexan XHR2000 sheet material for aircraft interiors last year, including two additional variations that come in one- or two-sided hard coat options, called Clear Lexan XHR2HC1 and Lexan XHR2HC2 sheets. With 80 per cent light transmission, the innovative Clear Lexan XHR2000 sheet is both durable and thermoformable, while complying with strict airline standards for fire, smoke and toxicity. With introduction of coated Clear Lexan XHR2HC1 and Lexan XHR2HC2 sheets, Sabic offers grades that provide even more robust vertical burn performance.